I was sad to learn of the passing of Willie Davis yesterday. I was not entirely aware of Davis as a player, but to me he was represented by this particular baseball card … and this card was connected to my late cousin Jimmy. My oldest cousins on that side of the family all lived out in California. Growing up in New England, CA. had a rather mythical quality to it. It was where Disney was and where they made TV shows. I probably envisioned my cousins as always basking in the sunshine. I have to approximate because the memory is somewhat vague, but I believe it was around 1972 – 1974 that my Aunt Maggie (who has contributed a couple of posts to this site) and Jimmy came back east to visit. Jimmy seemed so much older than me, but the one thing that we had in common was baseball. Out in the backyard we tossed around the ball and tramped down my mother's flowerbed chasing wayward tosses. After receiving our scolding, we got to dig into my baseball cards. Jimmy was a Dodgers fan and must have told me stories about the players he liked and the excitement surrounding the team that was about to become a major National League powerhouse. 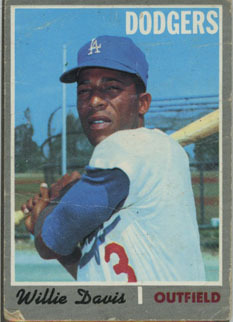 For whatever reason, this Willie Davis card would forever remind me of my cousin Jimmy. Whenever I would come across it over the years, I would remember that time playing catch and wondering how things were going in California. My cousin got dealt some hard blows through time, but the one thing I always knew would sustain him was his love of baseball. My Aunt reported on the games they had attended, that he watched or listened to them all, and also about her team, The Angels. Jimmy passed away earlier this year and now Willie is gone too. For one guy in particular they are connected together through this 1970 Topps baseball card. 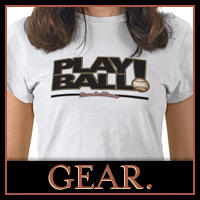 I hope that wherever they are there is a ballgame taking place.